Battery powered pressure gauge with exposed diaphragm for measuring high range pressures of viscous/pasty fluids or media which requires the use of hygienic equipment. Measure pressure ranges from 0-60 bar (900 psi) to 0-400 bar (6000 psi) gauge or absolute. Supplied with a G1/2 or a G1 male flush diaphragm process fitting for thread mounting. 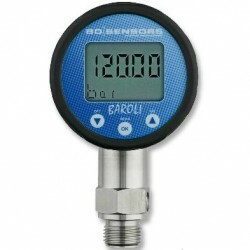 The Baroli 05P is designed for process and test measurements where the media is too thick or silty and requires an open diaphragm to ensure the gauge is able to respond quickly to changes in pressure. If the process media is food, beverage, dairy or medical, a food grade oil which meets FDA requirements can be specified to protect the process from harmful contamination in the event of a diaphragm leak. The wetted parts are stainless steels 316L which has a low surface roughness and the non-corrosive properties required for production processes that require a high grade of cleanliness. 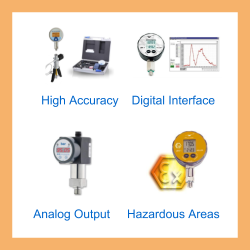 Please select the options you require for the Baroli 05P High Range Flush Diaphragm Digital Pressure Gauge in your application and request a quote. Enter the pressure range you would like to measure over. Send us your enquiry for Baroli 05P High Range Flush Diaphragm Digital Pressure Gauge to get assistance with this product type.